Amy Baldwin is Ernest Baldwin’s seven year old daughter, who died in November ten years prior to the events of Silent Hill 2. It is implied that Amy accidentally fell out of a window in the Baldwin mansion’s attic while retrieving a birthday card for her father. When Maria finds the birthday card in the attic, Amy’s voice tells her to give it to her father. Footsteps can also be heard while exploring the mansion, which may have been Amy’s ghost. Ernest Baldwin is a lonely, rather misanthropic entity that is found inside the Baldwin Mansion of the West South Vale district in Silent Hill 2: Restless Dreams. Ernest appears only in the expanded version of the game in the Born from a Wish scenario as a voice coming from behind a shut door. Ernest requests aid from Maria for a ritual, which he intends to use to resurrect his late daughter Amy, who accidentally fell out of a window in November on the day of his birthday 10 years prior to Silent Hill 2. He discusses Maria’s nature and her role in the rest of the game and also knows of James Sunderland’s sin. When Maria decides to open Ernest’s door, the room is empty. On the table is a pair of gloves and a birthday card — Amy’s birthday present to her father. Ernest appears as a ghost, indicated by the fact that he is never seen by Maria and this could be the reason why he is so reluctant to show himself to her; he claims to be unable to leave his mansion and when Maria finally enters the room he’s apparently in, it is empty. “Beware of haunted mansion!” is also written on the mansion’s exterior. “	The souls of those who died suddenly by suicide or accident don’t realize they’re dead. Sometimes they stay put and haunt that particular place. It is unknown how Ernest died. One theory is that after his daughter’s death, Ernest committed suicide; from the amount of toys in Amy’s room, it’s evident that Ernest loved his daughter very much and Amy’s death could have caused a severe depression in him as he mentions he’s “never forgotten” it. Another theory is that the corpse outside is supposed to be Ernest’s and that he was killed by a monster. Maria gives Ernest Amy’s birthday card and Ernest realizes the reason why she died. Ernest then says to Maria, “So you must be…! So that’s why… that’s why you could see me.” It is possible that by this, Ernest means that Maria is the one who will help him move onto the afterlife which is why he isn’t there after she opens his door. Do you know what it does to you, James? When you’re hated, picked on, spit on, just ’cause of the way you look? After you’ve been laughed at your whole friggin’ life?! 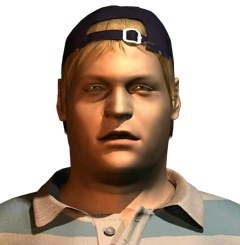 Eddie Dombrowski is a character from Silent Hill 2. He is conscious about his weight and has a troubled past which drew him to Silent Hill. Eddie was drawn to Silent Hill by his deeply troubled past and feelings of guilt. Not much is known about Eddie’s life before his arrival in Silent Hill, aside from the fact he worked at a gas station. Due to his obesity, Eddie had been bullied and verbally abused all his life, until his repressed anger began to manifest itself in the form of violent outbursts. He admitted to James that he had shot and killed a dog, and also shot a local football player in the knee, crippling him. He fled from the authorities, wandering for a while before coming to rest in Silent Hill, claiming that the town had “called him” there. Eddie wears khaki shorts and a blue-and-white striped polo shirt, together with a cap turned backwards. The clothes he wears are child-like and ill-fitting, only serving to draw attention to his obesity. On arriving in Silent Hill, Eddie is instantly brought into a nightmarish vision of his own personal hell, extrapolated from his cruel deeds and choices in life. Eddie is continuously found in the vicinity of a brutally murdered corpse, all the while claiming to have nothing to do with it. That is until he begins to lose his grip on sanity and proudly admits to his crimes with a sadistic cheer. Eddie eventually decides to kill anyone who mocks him, seeing that a person’s intelligence and looks mean nothing once they are dead. Eddie is first encountered in the Wood Side Apartments, vomiting copiously into a toilet in one of the rooms. He is rather nonchalant towards James Sunderland, who finds him and attempts to question Eddie about a corpse found in the apartment’s kitchen. Eddie answers evasively, claiming innocence and telling James that he isn’t even from Silent Hill. James suspects that, like him, Eddie was inexplicably drawn to the town. Eddie utters a nervous laugh and jokes that the corpse was already there when he arrived. Afterwards, Eddie runs off. A grave with his name on it (next to James’s and Angela Orosco’s) can be found in a courtyard later on. In the labyrinth, James is allowed to step into Eddie’s Otherworld; it appears to take on the form of a meat locker. It is bitterly cold, frosted over, and huge lumps of meat that are shaped like human bodies dangle from meat hooks, wearing the same shorts as Eddies; symbolic of Eddie’s obesity and desire for food, peers who had bullied him, or possibly a representation of how Eddie views himself. The meat locker presumably represents Eddie’s cold detachment from reality, and his lack of remorse in killing people. James tries to reason with Eddie, but Eddie’s growing insanity causes him to translate James’s reasoning into insults. He shoots at James with his revolver; James, in turn, is forced to protect himself, instigating a boss fight. During this fight Eddie will use his revolver and his fists, even attempting to pistol-whip James. Eddie will frequently hide behind the meat carcasses for protection. There are no other options than for James to kill Eddie to survive. Me and Mary talked a lot about Silent Hill. She even showed me all her pictures. She really wanted to come back. That’s why I’m here. Laura is an eight-year old girl who appears in Silent Hill 2, and is often seen wandering around the town. She is the only innocent human character in the town who does not hold any darkness in her heart, in contrast to James Sunderland, Angela Orosco and Eddie Dombrowski, and consequently does not see any monsters or serious abnormalities in the town of Silent Hill, including Maria. She is infamous in the series and to all players as she is, (as James himself commented), a brat, with little to no respect for her elders. 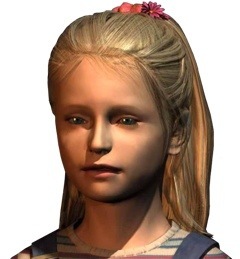 Laura is an orphan who befriended Mary Shepherd-Sunderland a year prior to the events of Silent Hill 2, having been a patient at the same hospital as her. Like James, she appears to be searching for Mary and is unaware of her death. How Laura’s parents died and why she was in a hospital is never revealed. It is possible that Laura does not see anything strange in Silent Hill because of her connection to Mary. Mary describes Silent Hill as a beautiful place, and shows Laura many pictures of the town. Laura’s version of the town would, naturally, be the beautiful place that she saw in the photographs. It’s also possible that Laura sees nothing in the town because her heart is pure, and she has no demons to be “exorcised” by Silent Hill. It could also be that Laura sees the people of Silent Hill as well as James Sunderland and Eddie Dombrowski. Laura’s and Mary’s nurse while they were patients at the hospital was Rachel, a young woman who lived in the same apartment complex as James’s father, Frank Sunderland. Laura acts rudely towards James Sunderland and Eddie Dombrowski, the two people she encounters consistently during her journey through Silent Hill. With James, she is motivated by the belief that he did not really love Mary, due to the fact that he rarely visited her in the hospital. As the game progresses, Laura is much less rude toward James. In the Lakeview Hotel, she gives him more details about Mary, and runs away to find a letter that she dropped. In Room 312, she immediately asks James to leave the hotel with her. Even though Laura is perceived as a rude character at first, it can be taken that she is simply misguided and not necessarily malevolent-spirited. It is possible that she is merely looking for someone to become her role model. 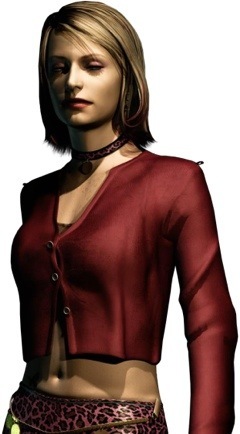 Laura is, appearance wise, very similar to Cheryl Mason from the first Silent Hill. They both wear dresses with shirts or jumpers underneath. Laura wears a striped long sleeved shirt under a denim dress. She wears shiny black shoes with long, white socks pulled up just below her knee. She wears her hair in a loose ponytail. Laura somehow finds her way to Silent Hill, having apparently ran away from the orphanage, foster home or hospital she was staying at. James first encounters Laura in the Wood Side Apartments, where she kicks a key out of his reach and stomps on his hand before running away. After he leaves the apartment complex he finds Laura humming to herself on a wall. He confronts her in frustration, and Laura taunts him by believing she ‘may’ have stomped on his hand. She then reveals to James that she knows of Mary, but then jumps off the other side of the wall before James can get anymore information out of her. The next time she is seen is at Pete’s Bowl-O-Rama with Eddie, who she met by chance on the way to Silent Hill. Eddie tells her that he is running from the police, and Laura calls him a “gutless fatso”. Laura then confides that she too runs away a lot, and asks Eddie why he can’t just apologize for what he has done. In response, Eddie tells her that nobody will forgive him. Once James appears, Laura rolls a bowling ball towards James and Eddie and then runs away. Outside, James pursues her at Maria’s request. Laura finds a way to Carroll Street by squeezing through a narrow space between Heaven’s Night and a wall, then enters Brookhaven Hospital. Eventually, James finds her inside a room playing with teddy bears on the first floor. James accuses her of lying when she details her connection to Mary. He then apologizes for his outburst, and as James and Laura are about to exit the hospital, Laura asks him to pick up a nonexistent letter from Mary inside a room. When James enters it, she slams the door behind him, locking James in with several dangerous monsters. Laura is seen again on Carroll Street through a hospital window. She makes her way to the Lakeview Hotel, presumably following Nathan Avenue which is blocked by a road-in. It’s most likely that the road-in doesn’t exist through Laura’s perception of the town. At the Lakeview Hotel restaurant, “Lake Shore”, Laura hides behind a piano. When James enters the restaurant, Laura slams on the piano keys, startling him. It’s worth noting that James used to watch Mary play the piano, and it’s likely this scene is a trigger for James’ memories. Laura then shows James a letter confirming her friendship with Mary, which she took out of their nurse’s (Rachel’s) locker. My dearest Laura, I’m leaving this letter to Rachel to give to you after I’m gone. I’m far away now. In a quiet, beautiful place. Please forgive me for not saying goodbye before I left. Don’t be too hard on the sisters. And Laura, about James… I know you hate him because you think he isn’t nice to me, but please give him a chance. It’s true he may be a little surly sometimes, and he doesn’t laugh much. But underneath he’s really a sweet person. Laura… I love you like my very own daughter. If things had worked out differently, I was hoping to adopt you. While James reads the letter, Laura draws a cat on the patio door. After he finishes reading the letter, James asks Laura how old she is and Laura tells James that she turned eight last week, meaning that Mary couldn’t have died three years ago. Laura then runs away again looking for “another letter” (most likely the final letter that Mary wrote to James). James decides to tell Laura the truth.In Room 312, Laura finds James after he has learned the truth of Mary’s death. She becomes furious with James when he tells her that he killed Mary, shouting that she hates him. James tells her that the Mary they know isn’t in the hotel, and Laura silently leaves the room. In the “Leave” ending, James leaves Silent Hill with Laura (how he found her and convinced her to leave Silent Hill with him is not revealed) and they travel through Toluca Graveyard. James is following Laura, who is a few feet ahead of him. Laura then stops and waits for James to catch up to her and then leaves the town. They vanish into the mist, one after the other. This ending could mean that James is possibly intending to carry out Mary’s wishes to adopt Laura. Laura does not appear in the game’s other three endings, so it is not revealed to what happens to her. However, since the town was never dangerous to her, it is assumed that she gets out of Silent Hill unharmed. “	It doesn’t matter who I am. I’m here for you, James. See? I’m real. Maria is one of the main characters in Silent Hill 2. She meets up with James Sunderland in Rosewater Park and stays with him sporadically after that. She is physically identical to James’ late wife, Mary, although her appearance and personality are more sexually extroverted. Maria is a very enigmatic character, and she could be seen as some sort of reincarnation or ghostly form of Mary, as a supernatural and possibly sinister creature of unknown origin, or some combination of these. At times she seems to channel Mary’s memories. James is both attracted to her and fearful of what Maria might represent, and he struggles to understand her. Maria appears to be some sort of phantom created by James’ desperation to see Mary again, an idea supported by the title of Maria’s scenario, Born from a Wish. Born from a Wish suggests that in the beginning, even Maria isn’t really sure who or what she is, but by the time she first encounters James she is beginning to “remember” him somehow. Since the title is called Born from a Wish, many people assume that Maria is one of James’ wishes since Mary wasn’t everything James had wanted. The booklet accompanying the game describes her as the opposite of Mary, “cheerful and energetic,” but she’s also a rather dark and moody character. Her personality is highly unpredictable: sometimes she is fearful and clingy, at other times she speaks tenderly to James, and at other times she is more teasing or even cruel. She also seems to have Mary’s personality and memories at times, given that she is representation/illusion of Mary. This behavior is exhibited in the Labyrinth jail cell, for example; cycling from Mary’s sweet, soft tone and even her memories to Maria’s more seductive tone. She seems consistently concerned about Laura, the little girl who has a connection to Mary. Due to some of her behavior and her attempts to make James accept her (even going to the extreme of trying to kill him when he refuses her), she can be considered the main antagonist of the story as she tries to “trap” James into his past, refusing to let him go. Despite her actions, Maria is not a truly evil character. Chronologically speaking, the Born from a Wish minigame serves as Maria’s introduction in the Silent Hill universe, although this prequel game was created after Silent Hill 2’s release. The Maria seen in Born from a Wish is much less sassy and confident than in the main game, and it is suggested that she has no memory of who she is or how she came to be there, furthering the ambiguity of her origins. It is also learned that Silent Hill is Maria’s birth town, indicating that Maria had either lived in Silent Hill before or this is just where she was created from James’ wish. Maria was produced by James’ delusions as a result of his inability to bear the weight of the crime of killing his wife. It is established in Silent Hill 3 that her model was a dancer at the club “Heaven’s Night”. While she’s exploring the house, she finds a teddy bear in a child’s room. She comments that Laura would love that toy (suggesting she has Mary’s memories). After Maria brings back the white liquid to Ernest, he reveals slightly more about her. Maria tells Ernest she doesn’t really believe in “Fate” and he warns her that James is a bad man, and that he’s looking for “the you that isn’t you”. This seems to stir something in Maria, who begins to remember things about James — that he wasn’t good with his wife during the illness and killed her. But she also remembers that underneath James is a kind person. Maria then opens the door, but the room where Ernest is in is empty. She leaves the Baldwin Mansion and enters the alley behind the Blue Creek Apartments. She briefly considers suicide, but refrains and tosses her gun over a wall. She decides to follow her fate, hoping that James would accept her as she is. Some ways into the main game, Maria’s story begins (or resumes, following the prequel minigame) when James Sunderland stumbles across her in Rosewater Park; seeing her in the fog, he mistakes her for Mary. He is taken aback by how much she resembles Mary, and her response is seductive and somewhat mocking. As James is about to leave, she then turns clingy, pointing out that there are monsters everywhere and asking if she can stay with him; he reluctantly agrees. James and Maria eventually make their way to Pete’s Bowl-O-Rama. James enters but Maria stays behind, her excuse being that she “hates bowling.” When James returns minutes later, Maria says that she saw Laura run out of the building and insists that James help look for her. Eventually they follow Laura to Brookhaven Hospital. They explore the hospital together, however, Maria suddenly becomes sick. James tells her to rest and leaves her in one of the hospital rooms. If the player checks on her she will still be there, albeit looking very unwell. Later on, when James traverses into the Otherworld version of the hospital, Maria is nowhere to be found, but several empty medicine bottles are nearby. Fortunately, Maria bumps into James in the hospital’s basement but grows angry at James’ lack of concern towards her, and his devotion to Mary. Their time together though is short-lived as while running through the hospital’s basement, Maria is killed by Pyramid Head in front of James. While exploring the Labyrinth, James stumbles onto Maria, locked behind a cell wall. She confuses James by talking to him in a very peculiar manner and behaving in a way similar to Mary’s personality (especially when she mentions his videotape in the Lakeview Hotel.) She then reverts back to her old self and tries to seduce James very suddenly, hinting sexual favors if he gets her out of the cell. Desperate and confused, James promises to return once he’s found a way to rescue her from the cell, but when he does finally return, Maria is dead again; she appears to have been beaten to death. Towards the end of the game James finds Maria alive again, this time strung up and being tortured by two Pyramid Heads. Maria calls out for James to help, but he can only watch as one of the Pyramid Heads impales Maria in front of him with its spear. He realizes that Pyramid Head keeps killing Maria to remind him of his crime and to punish him for murdering Mary. James fights the two Pyramid Heads and they realize that they cannot defeat him; they kill themselves as they are no longer needed – James finally understands his sins. In the In Water, Leave and Rebirth endings: When James goes up to the platform at the end, Maria is there, although she disguises herself as Mary, as a final, desperate attempt to make him stay with her. However, James tells her he no longer needs her, as she could never substitute the true love he shared with Mary. Angered at this, she transforms into the final boss and tries to kill James, but ends up being defeated. Maria crashes to the floor and whispers his name, until James finally kills her for good. In the Maria ending, when James goes up to the platform at the end, Mary appears instead of Maria. She tells him that James killed her because she was a burden to him. He admits that it’s the truth. Mary tells James she will never forgive him for what he did and transforms into the final boss. After she is defeated, James is looking out over the lake from Rosewater Park, where he first met Maria. Here, he reunites with Maria, who is once again alive and well and they leave Silent Hill. As they leave Silent Hill, however, Maria starts coughing, implying she has the same illness Mary had suffered from, and that the events that drove James to murder may repeat themselves. Interestingly, which ending the player gets is based on subtle aspects of how Maria is treated during the game. If the player protects her well from monsters and visits her frequently while she is feeling sick at the hospital, they are more likely to get the “Maria” ending. Maria frequently reminds James that she’s “real”. When they first meet, she states “I don’t look like a ghost, do I? See, feel how warm I am!” and later, “It doesn’t matter who I am. I’m here for you, James. See? I’m real.” This is open to many interpretations, including that Maria is solely meant for James himself, as he (besides Ernest, who was hinted at as being a ghost) is the only person she encounters. This is most likely the reason she stays outside of the bowling alley, avoiding Eddie and Laura. Maria is never present whenever James encounters another human; she is aware of Laura and claims to have seen her, but the two characters are never seen together. Her isolation from the other characters enhances her phantom-like qualities and furthers the idea that she was created for James alone, though in the Born from a Wish scenario, it is revealed that Maria knew about Laura before she met James and does not know why she knows Laura. By the time James meets her, she already knows that he killed Mary. Maria decides to follow her “fate”, and seems to keep reminding James of Mary’s death, as Maria (an illusion of Mary) dies many times during the game. Because Maria is an “illusion” of Mary and has her memories, she wants to keep Laura safe, and requests for James to look for her. She shares the desire from Mary for James to love her, for example, in the hospital when she asks what James would do if he couldn’t find Mary. She also knows James’ name and says it many times, even though he never told her his name before. James never seems to notice that he never told Maria his name. Thank you for saving me. But… I wish you hadn’t. Even Mama said it… I deserved what happened. Angela Orosco is a disturbed, unstable girl in her late teens who is on a search for her mother during Silent Hill 2. Her mental state appears to be damaged by her emotionally, physically and sexually abusive past. 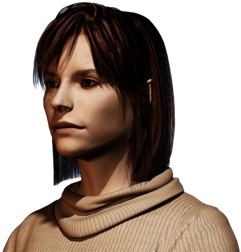 Angela is voiced in the game by Donna Burke, who also voiced Claudia Wolf in Silent Hill 3. Her appearance in the game and the choice of her portrayal were made by Team Silent. Angela wears a white or beige sweater which reaches her waist; the sweater also has a loose turtle neck. She has reddish-brown jeans. The shoes that she wears are casual and dark blue. Angela’s hair is a very dark brown and shoulder-length. She also wears a hair pin with a red jewel over her right ear. Her introverted nature and the covering of her entire body may result from her past sexual abuse and the uncomfortable feeling of being exposed, which is common among victims of abuse. Ever since her rough and broken childhood, Angela was convinced that she would never be happy. Her father, Thomas Orosco, an alcoholic lumberjack, had raped and sexually abused her as a young girl, causing her much hostility towards other men. Other abuse that Thomas Orosco had inflicted on Angela involved physical abuse; Thomas would often beat her while inebriated. In addition to Thomas abusing her, Angela’s brother would abuse her as well. Meanwhile, Angela’s mother had frequently reminded her that she deserved her abuse (for being a seductress) and Angela endured it as she grew up. Despite that Angela’s mother knew what was happening, she never intervened. As a consequence of this, Angela’s internal pain and suffering had influenced thoughts of suicide upon her. Angela attempted suicide many times in the past but always ended up hesitating at the last moment. At an unknown point in time, Angela’s mother left her family, leaving Angela alone with her father and brother. After Angela graduated high school, she ran away from home but was found and brought back by her father. She killed her father and brother in return, and being in a state of emotional turmoil afterwards, she was called to Silent Hill to find her missing mother. 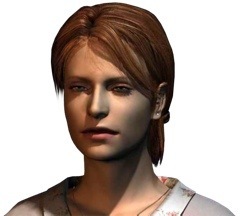 In the Silent Hill 2 novelization, it is revealed that Angela worked as a minimum wage restaurant employee, a job she absolutely despised due to her distaste of the smell of meat and the male customers always trying to touch her. On the way to Silent Hill, James Sunderland encounters Angela in a cemetery examining a grave, where she warns him that there’s “something wrong” about Silent Hill. She tells him that she is looking for her mother, her brother and her father; however, Angela had murdered her father and brother prior the events of the game (similar to James, who tells her that he is looking for his wife, despite Mary being dead.) It can be assumed that Angela either lied to James or repressed the memory of her murders. She is next seen in Room 109 of the Blue Creek Apartments with a knife, contemplating suicide beside a large mirror. Through Angela’s dialogue, it is heavily implied that Angela’s mother once lived in Silent Hill. James takes Angela’s knife from her at her request. At first, she jumps back and points it toward him as if defending herself, but then she calms down and apologizes. She flees in panic after he initially tries to take it out of her hand. Examining the knife often is one of the factors which enables the “In Water” ending of the game, in which James kills himself. In the labyrinth area, a newspaper article can be found stating that Thomas Orosco, a lumberjack, has been stabbed to death in the neck with a knife. James then hears Angela’s cries for help and finds her in a state of catatonia, cowering away from a monstrous version of her father. After James defeats the creature, Angela viciously kicks it and throws a television on it, killing it. Angela, acting with disdain and general hatred towards James (and all men), falls to the floor and sobs; James tries to console her and Angela screams at him to not touch her. She then accuses him of abandoning Mary for another woman before leaving the room. Angela is last seen at a burning staircase in the Lakeview Hotel. Initially, she confuses James for her mother and proceeds to ask him if he would take her in his care, but James looks down, ashamed. Finally, Angela asks James to return her knife but he declines, to which Angela asks if he is saving it for himself. Afterwards, James states that the room is hot as hell, and Angela replies that it’s always like this for her; her life was always a living hell. Angela ascends the burning staircase and disappears into the flames. James… You made me happy. —Mary to James in her letter. Mary Shepherd-Sunderland is the deceased wife of James Sunderland. The couple had vacationed in Silent Hill a few years prior to the events of Silent Hill 2. Mary was a kind, sweet young woman who spent the last moments of her life in turmoil after acquiring a terminal disease. James and Mary had met at a house party held by a mutual friend. Their affection evolved from a blazing passion to a peaceful and stable relationship. Before Mary and James were married, James would listen to Mary playing the piano. Mary liked to play the piano and even though she wasn’t very good at it, James still loved to hear her play anyway. Prior to the events of Silent Hill 2, Mary and James vacationed in Silent Hill. They stayed in the Lakeview Hotel, where James recorded a videotape of Mary in Room 312, although James accidentally forgot the videotape in the hotel and the couple left Silent Hill. Mary stated in the videotape that she loved the town and would love to go to Silent Hill again one day. Not too long after their vacation, Mary fell ill with an incurable, terminal disease and was bedridden in a hospital. She was given three years to live, which she was forced to spend in the hospital. The disease had altered her skin tone to a sickly shade of tan and promoted hair loss, dissolving any traces of beauty she once possessed. Mary did not take her predicament well. In anger, she lashed out at those closest to her, especially James. It is understood that James did not visit Mary in the hospital very frequently because the disease seems to bring out tensions between the couple. James in the game (upon examining some alcohol bottles) states that he drinks “a fair bit”, most likely due to missing Mary and the joy they once had. Nevertheless, Mary was able to find sanity in thoughts of Silent Hill, the last place where she was happy. She talked about the town with another patient, the orphan Laura, and the two bonded. Often, Mary would wait for James, and Laura would console her when he did not show up; this is most likely why Laura states that Mary was always waiting for James and is reluctant towards him. If things had worked out differently, Mary was willing to adopt Laura; in the “Leave” ending of the game, James leaves Silent Hill with Laura, possibly to carry out Mary’s wish. In the later days of her life, Mary wrote farewell letters to Laura and James and requested that her nurse, Rachel, give the notes to them after her death. Mary was permitted to return home for a short while, although it was only because her death was imminent and she was afraid James would not see her again before she passed away. At their home, James was tasked with being Mary’s caretaker. It was not the disease that killed Mary, but her husband James, who suffocated her in her bed with a pillow. James sees himself smothering Mary on the videotape that he forgot at the Lakeview Hotel years ago, and this is how he eventually remembers his homicide. While the Book of Lost Memories suggests the possibility of James taking Mary’s body with him to Silent Hill in the trunk of his car, the novelization affirms it and follows the “In Water” ending. However, Masahiro Ito, on his Twitter page, said that that he believed Mary’s body was actually on the back seat. Although physically dead, Mary lives on as James’ delusion. Repressing the memory of murdering Mary, James believes that he received a letter from Mary beckoning him to come to Silent Hill where she is waiting for him in their “special place”. He uses this as the basis for a delusion that Mary is still alive. He is also convinced that Mary died three years ago, when in reality, she was still alive one week ago. Mary was also re-imagined as Maria, a creation of James’s will. Maria appears to be a sexier, more wild version of Mary, possibly what James thought Mary had lacked in some areas. Maria’s scenario’s title, Born from a Wish has some truth to it after all. At one point in Born from a Wish, Maria can examine a teddy bear and she thinks that Laura would love it, showing that she has Mary’s memories. Maria remembers what James did to Mary, but also remembers that underneath, he is a kind person. Occasionally Maria reveals knowledge of Mary’s past to James. Near the end of the game, Mary’s voice calls James to find her after James tells Laura that Mary is dead. James is led to a hallway in which the player hears a previous conversation that he and Mary had while she was still alive. In this conversation, James offers Mary the flowers he has brought her. She immediately rejects them, lashing out at him and protesting that she is too disgusting and ugly to receive flowers. Shortly after this, she experiences another mood swing and begs James to forgive her, pleading for him to stay with her and assure her that she is not going to die. Mary says various things in each ending to James, who has become aware of the crime he has committed. It is conceivable that her death three years ago is merely James’ delusion. In the “Maria” ending, Mary will be sitting on a bed at the top of Lakeview Hotel. She is pleased to see James, but is displeased about him needing Maria. “I wanted to see you… even an illusion of you,” James states. Mary then angrily shouts “James, do you really think I could ever forgive you for what you did? !” Mary then turns into a monstrous version of herself. After James kills Mary again, he meets Maria but she coughs while they leave the town, implying that Maria may have Mary’s illness, that James hasn’t learned anything from his experiences in Silent Hill, and that the events that brought him there may repeat themselves. In all of the other endings, the woman who James has to defeat will be Maria instead of Mary. In the “Leave” and “In Water” endings, James is seen having a final conversation with Mary. In this conversation, James is able to resolve things with Mary and move on with his life. Mary says, “James… please do something for me. Go on with your life.” Mary then gives James the letter that he never received. In the “Rebirth” ending, James attempts to resurrect Mary, with unknown results, by rowing the boat he used to get to the hotel to Toluca Island. I was weak. That’s why I needed you… Needed someone to punish me for my sins… But that’s all over now. I know the truth. Now it’s time to end this. —James, upon realizing Pyramid Head’s purpose. James Sunderland is the protagonist of Silent Hill 2. As the game begins, James states that his wife, Mary Shepherd-Sunderland, has been dead for three years. Regardless, James has received a mysterious letter in Mary’s handwriting, stating that she is alive and waiting for him in their “special place,” somewhere in Silent Hill. When James arrives at the town, he becomes ensnared in a series of bizarre and nightmarish events which force him to question his sanity, memory and personality. Due to the player’s actions during gameplay and their own interpretation of James, his personality can be viewed differently. As stated by the developers of the game, James can be thought of as one of two personalities. Maria describes James as kind; and Mary, in her letter to Laura, describes him as someone who is a little surly, but underneath his enigmatic exterior, is a sweet person. During his encounters of the other individuals visiting Silent Hill, he typically shows courtesy and manners while speaking to them. Throughout the game, however, James’ “dark side” is revealed in some of his actions. While talking to people, he may occasionally experience an outburst as a result of a reflex, but will typically and automatically switch back to his alternative persona after doing so. It is notable that James lost some of his “power” and respect for himself when Mary acquired her disease, as well as when he murdered her. He speaks quietly, prefers to run where possible, hides to avoid confrontation, is unable to open things which Maria is able to, and never stood up for himself when Eddie or Angela were abusing him. However, after each confrontation with Pyramid Head, there’s a notable confidence in his voice and actions afterwards. It may also be noted that James is perceived as “dumb” in many parts of the game, including leaving his car door open, failing to turn off his flashlight while attempting to hide in a see-through closet and proceeding to stick his hand inside a hole in the wall after being bitten by something within. He also exhibits many actions that would appear unusual to the average person, such as sticking his hand down a filthy toilet and failing to wash his hands afterward and jumping down several holes that appear bottomless from above. According to the Konami publication Book of Lost Memories, James was a clerk prior to his arrival in Silent Hill. His known family includes Frank Sunderland, from Silent Hill 4: The Room, who is revealed to be his father. Not much information about James before Mary came into his life is known. James and Mary had met at a house party held by a mutual friend. Their affection evolved from a blazing passion to a peaceful and stable relationship. Before Mary and James were married, James would listen to Mary play the piano. Mary liked to play the piano and even though she wasn’t very good at it, James still loved to hear her play anyway. Prior to the events of Silent Hill 2, Mary and James decided to take a vacation in Silent Hill after reading a brochure for the town. They stayed in the Lakeview Hotel, where James recorded a videotape of Mary. Mary stated in the videotape that she loved the town and would love to go to Silent Hill again one day. James accidentally forgot the videotape in the hotel and the couple left Silent Hill. Three years prior to the game, Mary was struck with a terminal disease, and she eventually deteriorated to the point of having violent mood swings. This led James to drinking alcohol, in order to get away from his pain and loneliness, but it never changed anything. James questioned Mary’s doctors about her illness and voiced his disbelief about them letting Mary die. He would often search through medical books for information about Mary’s illness, but would never find anything useful. James rarely visited Mary in the hospital because the disease caused Mary to lash out at him. James eventually felt frustration at needing a sexual outlet but feeling prevented from pursuing it by his marriage to Mary (this is later expressed by the character of Maria, as well as several creatures during James’ quest in the town). Mary had become a burden on James and he slowly began to build resentment toward her, yet seeing her in such pain tormented him. The emotional trauma and emptiness left James in a constant state of mourning. Eventually he snapped, walked to Mary’s bed and kissed her on her forehead, only to suddenly suffocate her with a pillow. James later repressed the memory of his wife’s murder. James then receives a mysterious letter in Mary’s handwriting, stating that she is alive and waiting for him in their “special place”, somewhere in Silent Hill. James is disturbed and confused about this letter, and questions whether or not Mary truly died. Later in the game, the handwriting on Mary’s letter disappears, revealing itself to be a piece of blank stationery (it becomes an empty envelope and then finally vanishes from James’ inventory completely). This is because the letter never existed and was only a creation of James’ imagination. James drives to Silent Hill, with Lost Memories suggesting he came to kill himself in the town they cherished. James is not the only one called to Silent Hill; two others, Eddie Dombrowski and Angela Orosco, have been drawn to the town by similar forces. However, before he arrives, his mind snaps from the trauma of killing Mary and he represses the memory. Instead, he becomes convinced not only that Mary has been dead for three years but that he has received a posthumous letter from her. It is at this stage that the player takes control of James, to discover the real events leading up to this point during gameplay. James discovers the main road to Silent Hill is blocked and takes a stop in the Observation Deck’s restroom. He takes a moment to stare deeply at his own reflection in a mirror. He exits the restroom, reminds himself of Mary, and then enters the town via a hiker’s path, a trail the designers created to be purposefully long in order to increase the player’s sense of isolation. On the way he meets a young woman named Angela Orosco, who has also just arrived in Silent Hill. James disregards Angela’s warnings about the town and reaches the main roads only to discover that the entire area is covered in fog and infested with grotesque monsters. He tries to find the “special place” mentioned in Mary’s letter, where she is waiting for him. James’ first guess as to Mary’s “special place” happens to be his first destination, Rosewater Park. Because all direct routes are destroyed or barricaded, he must cross through an abandoned apartment complex, where he meets Eddie Dombrowski. The apartments are also the scene of James’ first encounter with Pyramid Head, a relentless persecutor who hunts down and attacks him at several points in the game. James also repeatedly runs into a mysterious little girl named Laura, who knows of Mary’s name, leaving James curious as to what she knows. When James reaches Rosewater Park’s lakeside observation deck, he thinks he sees his wife, but is mistaken when the woman introduces herself as Maria. James agrees to let Maria accompany him for safety’s sake. He remembers his other “special place”, the Lakeview Hotel. While tracking Laura to Brookhaven Hospital, Maria stops to rest in a patient’s room, claiming to have a mild hangover. James eventually finds Laura, who then convinces him to get a letter from Mary in a room. She then locks the door, trapping James in the room with creatures called Flesh Lips. After defeating the monsters, James quickly finds that the hospital has been horribly transformed to the Otherworld. He finds Maria and they try to find a way out of the hospital. In the basement, Pyramid Head reappears behind both of them, and Maria is killed by the creature’s spear while James is helpless to save her. James is saddened by her sudden death and refocuses on finding Mary. After leaving the hospital and exploring the town, he finds a key that lets him into the Silent Hill Historical Society, which according to the map is also a port to get to the Lakeview Hotel. However, he soon finds a series of disturbing secret entrances and bizarre holes that lead him into Toluca Prison. Eddie resurfaces again in the cafeteria, now armed with a revolver and once more sitting in close proximity to a human corpse. James attempts to reason with Eddie, but his reasoning has no effect on him. As James explores the empty prison facility, he finds himself within a maze. James finds Maria, locked inside a cell, alive and unscathed following her death in Brookhaven Hospital. Maria comes onto James and beckons him to find a way into her cell. She undergoes a change in personality, switching between Mary and Maria’s personalities at random. Maria also drops clues regarding Mary’s “special place” and a videotape she and James made together. James soon relocates Angela, who is about to be attacked by the Abstract Daddy, a creature representing Angela’s abusive father. After injuring the monster, Angela finishes it off in a series of violent attacks and has a tense confrontation with James. Eventually, James locates an alternate route to Maria’s cell, but upon entering, finds Maria lying dead on the bed. James exits the cell, and jumps through a hole representing his future grave. He stumbles upon Eddie surrounded by bullet-ridden corpses. Eddie gleefully admits the solution to his problems is killing. When James protests, Eddie says that James is making fun of him too and attacks him. Eddie reveals that both he and James were summoned to the town for a similar reason. James is then forced to kill Eddie in a gun battle inside a meat locker. Emerging at an old pier at the edge of Toluca Lake, James sees a bright light that is visible from the northern shore; he boards a rowboat and makes the journey to the opposite side. The light is emanating from the Lakeview Hotel, which looks exactly the same as when he stayed there with Mary. James finds Laura there and she hands him a letter that was written by Mary. It states that Mary and Laura became friends one year ago and James realizes that Mary couldn’t have died three years ago. Laura then leaves him again to find the other letter. James locates the old videotape mentioned earlier by Maria, and finds his way to Room 312, where he and Mary had stayed on their vacation. Inserting the tape into a player, James watches a static-ridden video of himself as he smothers Mary to death with her pillow. Laura enters the room and asks James if he has found Mary yet and James tells her the truth, causing Laura to yell at him and run out of the room. Exiting the room, James finds the hotel flooded and burnt-out and eventually comes across Angela on a stairwell surrounded by fire. Angela and James speak for the last time and despite James’ pleas, Angela proceeds up the stairs and walks into the flames. Entering what was once the lobby, James finds Maria, alive and tied down, screaming for James as she is surrounded by two Pyramid Heads. For a third time, Maria is killed and James finally understands what Pyramid Head and Maria are. The Pyramid Heads are a part of James himself, created subconsciously to punish him for his sins. Refusing to flee from his opponents, he turns and attacks the Pyramid Heads. With James now seeking vengeance as opposed to punishment, the Pyramid Heads cease to function and they deliberately impale themselves on their spears.